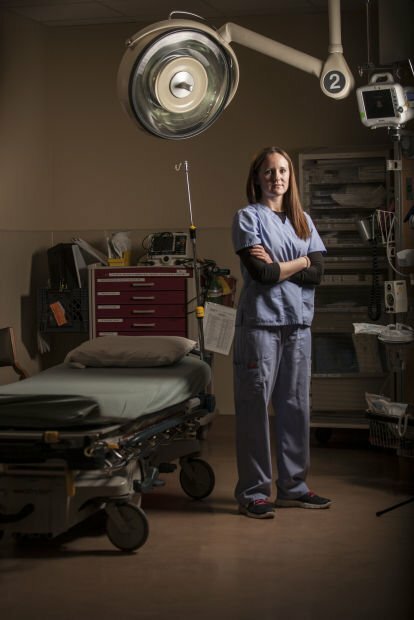 Registered nurse Amy Sorensen poses for a portrait Friday at Wyoming Medical Center in Casper. Sorensen was on a flight from Des Moines, Iowa, to Denver when the pilot suffered an apparent heart attack. She and another nurse cared for the pilot while the flight was diverted to Omaha, Neb. The pilot is expected to recover. Amy Sorensen had settled into a movie somewhere high above the Great Plains when a call came over the aircraft public address system. She heard a flight attendant asking for passengers with medical experience. 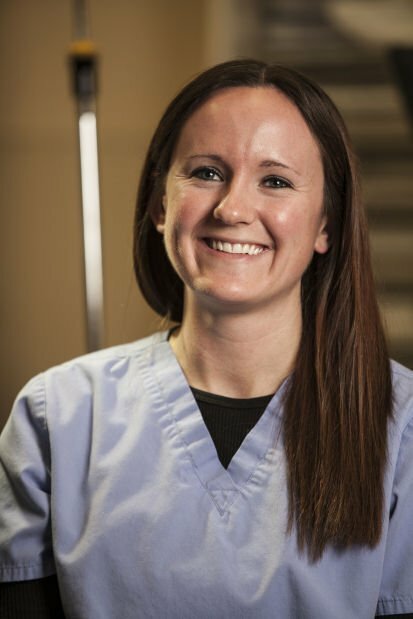 At first, the 24-year-old Wyoming Medical Center nurse figured the situation wasn’t serious. But then she heard a second call, again seeking help. Sorensen told a flight attendant she worked as an ER nurse. She made her way to the front of the United Airlines jet, which had departed Des Moines, Iowa, about 8 p.m. Dec. 30, bound for Denver. Sorensen entered the cockpit and knew immediately the situation was serious. The captain sat buckled into his seat, grabbing at the controls. He was pale and sweating through his uniform. His lips were blue and he complained of chest pressure – suggesting a possible heart attack. “Are we diverting?” she asked the co-pilot. Yes, she was told. The plane was heading toward Omaha, Neb. In the meantime, Sorensen needed to do what she could for the ailing man. A second nurse had also responded to the call for help. Together, they treated him in the galley, near the main cabin entrance. Another call came over the intercom. Now flight attendants were asking for anyone with flight experience. A retired Air Force pilot headed to the cockpit. The plane was stocked with a supply of medical gear. The flight attendants brought the nurses a bag of medications, an IV, a blood pressure cuff and an automated external defibrillator – a simpler version of the device doctors use to deliver electric shocks that can restore a normal heart rhythm to patients. Sorensen gave the captain a nitroglycerin tab to relax his blood vessels. She used the defibrillator to check his heart. It showed a potentially lethal rhythm. His blood pressure was dangerously low. Sorensen started an IV and asked a flight attendant to squeeze the bag of fluid. They also gave him oxygen. Sorensen, who has worked as a nurse for about a year and a half, worried the pilot would go into cardiac arrest. At one point, she told the other nurse to get ready. They would probably need to start CPR before too long. Time passed slowly. What more can I do, Sorensen asked herself. She thought of the equipment she wanted to use, but that was available in an emergency room, not in an aircraft miles above the Earth. Finally, after about 30 minutes, the plane landed in Omaha. A flight attendant asked whether they had time to taxi to the gate. The plane had barely pulled off the runway when the cabin door opened, revealing firefighters and medics. They moved the still-conscious captain to a litter and took him from the jet. After cleaning up, the nurses walked back toward their seats. The plane erupted in claps and cheers. Sorensen thought of the captain. “What more could I have done?” she wondered. She and the other passengers spent the night at a local hotel. They boarded the same plane the next day. A passenger from first class insisted Sorensen take his seat. After a seven-hour layover in Denver, she finally flew to Casper, arriving home close to 10 p.m. She was back at work at 7 the following morning. Sorensen hasn’t heard from United since the incident, save for an email regarding compensation for the diverted flight. But she spoke with crew members the day after the emergency. They told her the pilot was treated at an Omaha hospital and was in stable condition inside an intensive care unit. He was expected to recover. A collection of the top 20 most-read Casper and Wyoming stories from 2014.